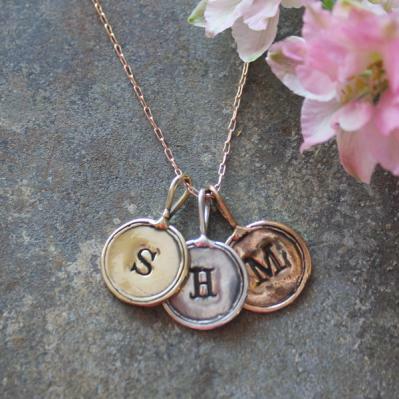 "Personalized Charm Necklace, Trinket Charm Necklace in Silver, Gold, Rose Gold"
Design a unique and beautiful necklace mixing gold, rose gold and silver to create a stylish and meaningful accessory you will love. You are the designer so show us your talent! Price is for a 16" sterling silver chain. 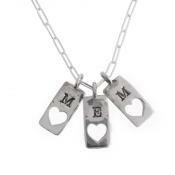 If you change chain metal type, length and/or add charms the price will change. Oops - please fill in all required fields. We love to mix metals and textures to create pieces that hold meaning and are stylish ~ and that is why the Trinket Charm Necklace is one of our favorites! You can either choose all silver, all gold, all rose gold or mix the three! Unleash your inner jewelry designer and create a piece that you will cherish! All silver is sterling, gold chains are gold filled. Gold charms are gold bronze or rose gold bronze. Charms range in size and vary between .5" and .28" in size. Crystals are Swarovski. Chains are available in 16"and 18". We only use sterling silver, 14K gold, gold filled, gold vermeil and bronze in our products. Each item is created by hand ~ from designing the original piece, to hand-stamping the personalization, polishing, packing and shipping ~ we oversee your piece from start to finish to make sure it is made with love. We design all of our products and do not use pre-fabricated blanks. This means our jewelry typically is heavier in weight making it sturdy enough to wear for a lifetime. Our signature lavender and rosebud packaging is available. So whether it is a gift for you or someone else, the surprise you get when you open the box will make you smile! Just a few people who have given our products their stamp of approval: Oprah, The Today Show, People Magazine, Southern Living, Parents Magazine and many more! This was my first purchase with Nellie and Lizzy and I will definitely be ordering again. I was looking for something stamped and came to the right place! My order- trinket charm necklace is perfect! The quality is first rate, the shipping was fast and the ordering was exceptional. This company takes pride in its work and values their customers. Order something special for yourself! You won't be sorry!! 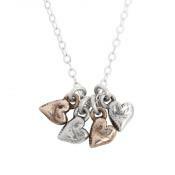 "Initial Heart Charm Necklace in Gold and Silver, Amore Necklace"